This is the second and final instalment of an interview with Aaron Hughes, editor of Method and Theory in the Study of Religion. Part one of the interview can be found here. Matt Sheedy: As a respected scholarly journal in the field and as the official journal of the North American Association for the Study of Religion, how do you see the relationship between MTSR and NAASR? Have there been any significant changes under your leadership and do you foresee any into the future? Aaron Hughes: The relationship between MTSR and NAASR has been a strange one. From what I can tell, this relationship was formed as one of mutual convenience when the University of Toronto graduate students who created the journal back in 1988 were looking for a press after having self-published it for a number of years. NAASR was only listed formally as the sponsoring organization of MTSR on the cover of volume 5 (1993), the first volume published by Mouton de Gruyter. While NAASR-players had been involved in the early years there was, until this time, no formal relationship. 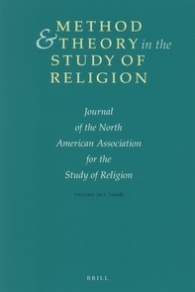 The “Journal of the North American Association for the Study of Religion,” which to this day graces every cover of the journal, seems to have been encouraged to entice further Mouton de Gruyter to take the journal by showing that it had an institutional link. The relationship has certainly morphed over the years. Whereas in the beginning, MTSR needed NAASR members to provide the journal’s content, the situation is now such that MTSR, as an internationally respected journal, provides NAASR with a prestige that it would not otherwise have. Many scholars in Europe, for example, know of MTSR without having heard of NAASR (other than the fact that this name appears on the cover of every issue). In fact, I would have to say that today MTSR’s biggest readership is in Europe. So while MTSR is an international journal, NAASR, by its very name, is a parochial organization, confined solely to North America. Reflecting this tension, it was not until last year that NAASR memberships began to carry an automatic subscription to MTSR. Before this coupling, subscriptions to the journal were separate from the actual membership in the organization. Thankfully, this has now been rectified. Let me now peer into the crystal ball and talk a little about the future. I have only been Editor officially since the beginning of the year (though I apprenticed for most of last year under the interim editors, Russell McCutcheon and Willi Braun). While the journal is only as good as the submissions it receives, my goal is to have more and more thematic issues or sections within issues. A journal with 4 or 5 completely different articles, while certainly interesting, can sometimes appear as too ad hoc. I would like to have pieces that bounce off of one another, argue with one another, and that respond to one another. I have tried to encourage select panels at NAASR or even the AAR to submit their (short) papers to me. Within this context, 25.4-5 will see the publication of the papers from last year’s NAASR Presidential Panel that was devoted to the future of the organization. I have also instituted a “Book Review Symposium” in which I send out a book to 4 or 5 scholars, have them examine it critically, and then invite the author of the book to respond. I think this worked fairly successfully for Bruce Lincoln’s most recent book in 25.2, and I am trying it again for The Sacred is the Profane by William Arnal and Russell McCutcheon next year. The key, though, is not to send these books out to those who will have only good things to say, but to those who have perspectives that might have been overlooked (for various reasons) in the initial work. My goal, in other words, is to facilitate dialogue and jump start conversations. I hope your readers will agree with me that one of the crises currently facing the field of theory and method is the increasingly intractable debate between humanists and cognitivists in the field. Is religious studies a humanities/social sciences discipline or is it a scientific one? While my own work and temperament situates me in the former “camp” (if that is even the appropriate term for it), I see it as my goal as Editor to make sure that both points of view appear in MTSR. Even more importantly, I see it as my job to help facilitate conversations between these two sides, hopefully even to show how they can crosspollinate one another. The future, then, is, I hope, promising for MTSR. I am not sure what the future of the field will be, but I can certainly say that I want MTSR to be at its center. MS: I was intrigued to hear you say that MTSR‘s biggest readership today comes from Europe, especially as the European religious studies scene, as a whole, often gets classed as more “theological” than the one in North America–though the situation in Great Britain may have a lot to do with this characterization. Could you say something about why you think there is a greater readership coming from Europe and mention which countries and institutions tend to be the biggest subscribers to the journal outside of North America? Are their any institutions/departments beyond the Eurowest that have shown an interest in MTSR? AH: I think you are correct in having the English context in mind. While there are certainly some excellent critical scholars of religion in Britain – I think of places like Kent, Glasgow, and Aberdeen – the tradition over there has historically been one of philosophy of religion, which for me is just another term for Christo-centric theology. This is, unfortunately, the major way religion is studied in places like Oxford and Cambridge, where the order of the day seems to be the articulation and defense of truth claims. Note that it is never the ideology of truth claims or how and why they are constructed, but truth claims plain and simple, as if they exist naturally in the world and can be uncovered by the pure or pristine human intellect (whatever that may be or look like). Perhaps in this context, it is worth noting that the European Review Index for the Humanities, a sub organization of the European Science Foundation, lists MTSR as a “research-starred journal.” Within this context, MTSR is listed in their classification in the highest category (Int1), while the Journal of the American Academy of Religion is listed only in the second ranking (Int2). Outside the “Eurowest” – no. Very little interest. I frequently receive papers on Islam from people in Saudi Arabia or Iran, but they are so apologetic and overtly theological that it is clear to me that they have no idea what the journal is about. They probably also submit to multiple journals at the same time. But I think the larger point here is that “theory and method” concerns – at least when it comes to the academic study of religion as we define it here and, by extension, in the pages of MTSR – are largely, as you put it, “Eurowestern.” I think this becomes clear at international venues such as the IAHR (International Association for the History of Religions). Is this good? I don’t know. All I can say is that it is what it is. My only hope is that MTSR might eventually make an impact in other countries. I note recently a couple of very good submissions that I have received from Italy, a country that I (at least) have traditionally associated with a more theological and Catholic perspective. MS: You mention that one of the crises currently facing debates over theory and method in the study of religion is that between humanists and cognitivists. Could you say something more about what you see as the major fault-lines in these debates and what kind of issues might be addressed in the pages of MTSR on this topic? AH: At stake, for me, is how we define the discipline: Is “religion” to be studied scientifically, social-scientifically, or in a manner that accords with the Humanities? At a time when the Humanities are constantly under assault for their relevance in the modern university, we might find it unsurprising that many want to make religious studies into a science by studying it from the perspective of cognition, evolutionary biology, and the like. Let me highlight this with an anecdote of sorts taken from a panel at the 2012 annual meeting of North American Association for the Study of Religion. The panel in question – to be published in 25:4-5 of MTSR – was devoted to “The Identity of NAASR and the Character of the Critical Study of Religion.” The major debate, as seen in Don Wiebe’s reaction to Russell McCutcheon’s paper, revolved around who should be in NAASR. In his paper, McCutcheon argued, inclusively, that NAASR finally needs to recognize that it consists of two dominant groups, those that engage in, what he calls, “theory-as-explanation” (i.e., the more scientific based model that seeks to account for the various biological and cognitive origins of religion) and those who engage in, again what he calls, “theory-as-critique,” that is, those who wish to scrutinize the tools scholars use to go about their work (i.e., the study of their methods). That two leading theorists in the field could have such radically different ideas of what constitutes the quiddity of “theory and method” is as problematic as it is telling. Their debate, and now it is necessary to frame it less in terms of the actual debate and more in terms of the field taken as a whole, amounts to a set of mutually exclusive discourses. Is religion to be studied theoretically, that is, scientifically, or is it to be studied methodologically, that is, from the perspective of the critical scrutiny of scholarly practices? Theory and method, previously entangled in their generic coupling, now risk turning their venom on one another. The politics of the so-called “theory wars,” like so much else in this country, risks becoming a veritable Kulturkampf. My goal as Editor of MTSR is to make sure that this does not happen, and that these two sides remain in a mutually productive conversation. And, to be honest, I am still trying to find ways of doing this. MS: Thank you very much for taking the time to share your thoughts with our readers. We would like to wish you the very best as you continue your work with MTSR. Aaron Hughes is the current editor of Method and Theory in the Study of Religion. He is professor of Religion, Jewish Studies, Islam, and Method and Theory in the department of Religion and Classics at the University of Rochester. Professor Hughes’s books include: The Texture of the Divine (Indiana University Press, 2003), Jewish Philosophy A-Z (Palgrave, 2006), The Art of Dialogue in Jewish Philosophy (Indiana University Press, 2007), Situating Islam (Equinox Publishing, 2007), The Invention of Jewish Identity (Indiana University Press, 2010), Defining Judaism: A Reader (Equinox Publishing, 2010), Abrahamic Religions: On the Uses and Abuses of History (Oxford UP, 2012), and the forthcoming The Study of Judaism: Identity, Authenticity, Scholarship (SUNY Press, 2013), and Rethinking Jewish Philosophy: Beyond Particularity and Universality (Oxford UP, 2014). This entry was posted in Interviews, Theory and Method, Uncategorized and tagged Aaron Hughes, Donald Wiebe, Method and Theory in the Study of Religion, North American Association for the Study of Religion. Bookmark the permalink.